Clayton Thorson runs to the boundary. 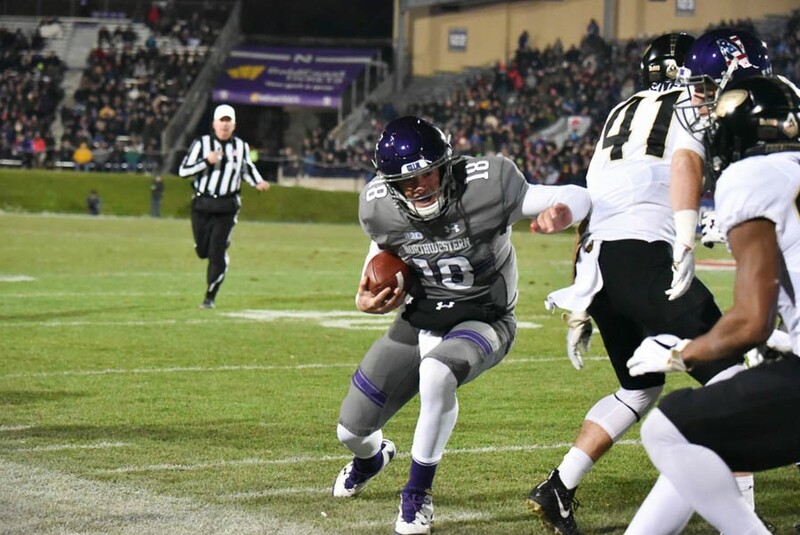 The junior quarterback had one passing touchdown and one rushing touchdown in Northwestern's victory over Purdue on Saturday. Northwestern ground its way to its fifth consecutive win on Saturday, holding off Purdue 23-13. In their first-ever November night game at Ryan Field, the No. 25 Wildcats (7-3, 5-2 Big Ten) used a late first-half surge to take a 14-0 lead into halftime, then tacked on three field goals by freshman kicker Charlie Kuhbander to protect that advantage in the second half. Junior quarterback Clayton Thorson completed 26 of 46 passes for 296 yards and two all-purpose touchdowns. Thorson looked towards his biggest target, sophomore receiver Ben Skowronek, for much of the night, helping Skowronek tally seven catches for 117 yards. NU’s defense bottled up the Boilermakers (4-6, 2-5) early, but then lost two key members of its secondary — cornerback Montre Hartage to a targeting-caused ejection and safety Jared McGee to an upper-body injury. That opened up more receivers for Purdue quarterback Elijah Sindelar, who finished with 376 yards, but the Cats made the stops they needed down the stretch to preserve the victory. 1. Called-back punt return ignites NU’s offense. Riley Lees appeared to open the scoring with an explosive punt return in the second quarter, until an unsportsmanlike conduct flag negated the play and sent coach Pat Fitzgerald into a rage about the call. But the Cats’ offense soon quieted the controversy by scoring a touchdown on the ensuing drive — then again on a 96-yard march two possessions later — to put the home team in control by halftime. 2. Cats’ run defense continues to dominate. Entering the day ranked 13th in the nation in rushing yards allowed per game, NU shut down a diverse Purdue rushing attack, conceding only 40 yards on 22 carries. A push from the defensive line stopped the Boilermakers on third- and then fourth-and-one near midfield early in the fourth quarter, forcing a turnover on downs that effectively killed Purdue’s comeback attempt. 3. NU’s postseason outlook continues to improve. The Cats’ win on Saturday, combined with ugly losses by Michigan State and Iowa in the conference, makes NU’s chances of finding its way into either the Holiday or Music City Bowl even more likely. The team could move up close to No. 20 in this week’s rankings, with No. 21 Iowa State and No. 17 Virginia Tech also losing.